Amarnath Cave (3900 meters) is a 150 feet high and 90 feet wide cave which is mentioned in ancient Hindu texts and scriptures and is believed to be the spot where Lord Shiva Mediated and told the secret of eternal life to his divine consort, Godess Parvati. The cave itself is believed to more than 5000 years old. An Ice Stalgamite, considered to be a Shiva Lingam by Hindus is worshipped with great fervour and devotion, which is formed due to freezing water droplets from the roof of the cave and grows up vertically utpo 20 feet and gradually wanes after. The cave is surrounded by snowy mountains and stays covered in snow except in summers. Modern kashmiris believe that cave is founded by a shepherd Buta Malik, while his flock got lost and took shelter in the shrine. His family still receives some portion of the alms offered by pilgrims. However, the earliest references of the cave is been mentioned in many Ancient Hindu Manuscripts believed to be thousands of years old. The spot which was accessible and known to only a select few, has been opened for the general public now as every year hundreds of thousands of devotees visit this ancient pilgrimage. The pilgrimage starts from Pahalgam situated at a confluence of Lidder River and a tribuatry flowing from Sheshnag Lake. It is also a famous tourist spot with breath-taking views. Among its many beautiful places the best of them are meadows of Baisaran, surrounded by beautiful pine trees. Also there is Betaab Valley, which got it's name due to the shoot from a famous bollywood movie of the same name here. It's an ideal picnic spot just 14 kilometers to Aru Valley which is another picturesque meadow and the basepoint for trekking to Kolhai Glacier and Tarsar Lake. 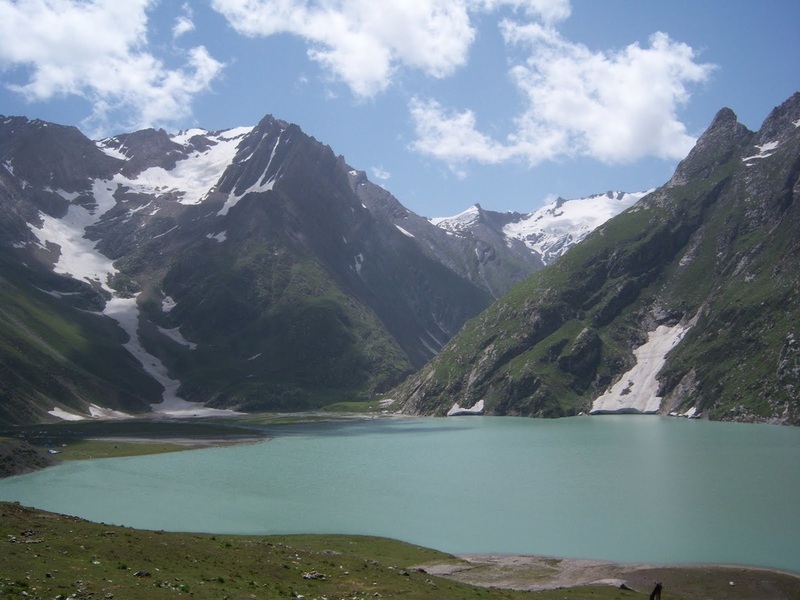 Enroute the trek to Amarnath the trekkers come across Sheshnag Lake which is a clear fresh water lake of high quality drinkable water and home to several species of fish including Trout. Situated at 3700 meters above sea level, the lake gets its bluish-green colour from its surrounding meadows. The Lake offers breath-taking views of the snow capped peaks as several tributaries beautifully flow to form the pristine lake. It is said to be the abode of Sheshnag the mythical king of snakes. The highest spot of the trek is Mahagunas Pass (4300 meters) which is not very far from Sheshnag Lake but takes considerable time of the trekker due to its steep climb and altitude. Pehalgam literally means Valley of Shepherds is a famous hill spot and a beautiful green valley in Kashmir. There are nice hotels and restaurants in Pahalgam. You can go sight-seeing to Aru Valley, Betaab Valley etc, have leisure walks and enjoy your stay in Pahalgam before commencing the tough trek next day. We will drive to Chandanwari from where our trek will commence. Situated at around 2900 meters, Chandanwari marks the commencement of Amarnath Pilgrimage/Trek and is usually filled with settlments, shops and free community kitchens during Pilgrimage months. The Pilgrims go through security check and Army Clearance before commencing the trek. From Chandanwari it's a steep climb to Pissu Ghati for about 1.5-2 Hours and then the ascent goes gradual as we reach Sheshnag Lake (3700 meters) after another 4-5 hours. Sheshnag is very windy and cold. Enjoy the views but keep yourself warm as you camp at Sheshnag. Many people still believe the mythological 5 headed king of snakes still reside in the lake and sometimes shows himself to the Pilgrims. From Sheshnag there is a casual walk of 15-20 mins until we cross a tributary. From there on the ascent becomes difficult and lack of oxygen makes it exhausting. You will notice that you will need to take rest at much shorter intervals. The steep ascent continues for 1.5-2 hours until we reach at top of Mahagunas Pass (4300 meters). From on there is a pleasant and gradual descent, and few switchbacks , waterfalls and crossings until we reach the beautiful camping site of Panchtarni. The views become stunning as we come close to Panchatarni as there are beautiful meadows on both sides of the paved path, a water stream flowing as we walk over the green grass and vast lush green landscape. Panchtarni offers much needed relief to the visitors after covering the trail over barren, rocky landscape. There is a beautiful camping site opposite wide Amarnath Stream, where users can take a dip, relax and unwind. From Panchatarni there is a 2-3 hours gradual climb towards the mouth of the wide Amarnath Cave (3900 meters). We feel blessed and humbled at the sight of such magnificence. Inside the cave, enjoy the calm and serenity as we view the three milky-white massive Lingas towering ahead of us representing Lord Shiva, Godess Parvati and their Son Lord Ganesh the obstacle remover. Feel blessed as you mediate on the divine view with folded hands and reverence as this pilgrimage is one of the most sacred of all for most Hindus. After spending some time in the cave, we descend a little and may choose to camp near the river flowing below the cave amid stars and beautiful view of the holy cave facing us. We can take an alternate route this time via Baltal, which is a steep descent sans beautiful views and scenery over loose scree and stones, which is a tiring journey of 6-8 hours, but will save a lot of time. 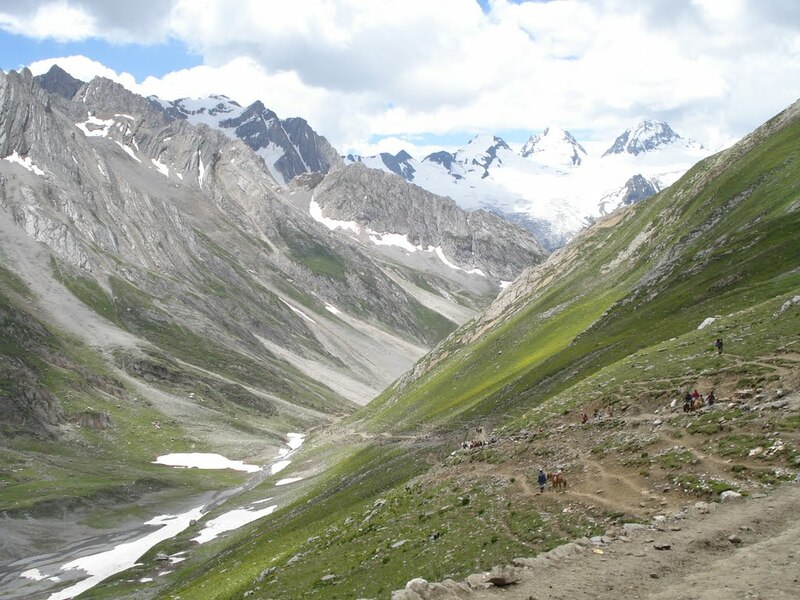 Baltal serves as a basecamp for an alternate and shorter route for most pilgrims visiting Amarnath Cave. It's a 14 kms steep walk, which can be covered in 4-5 hours by moderate trekkers.. Baltal offers scenic views of beautiful meadows with flowing water streams among settlements and shops for tourists. There is a helipad for those willing to take a chopper ride to the cave and back, a taxi stand and some tea shops. We camp here tonight and take our cab ride back to Srinagar or Sonmarg the next day.